I had a need to go to Hong Kong for a few days while I was in Bangkok and I decided to try something new. 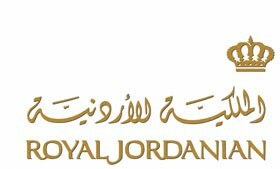 I found some quite cheap fares with Royal Jordanian and since they are in 'oneworld' alliance I decided to give them a go, and at the same time help out my Qantas Frequent Flyer status credits balance. Royal Jordanian only fly this route 3 times a week, as a continuation flight from Amman. On some other days of the week they fly the continuation to Kuala Lumpur instead. Up until quite recently this service was operated by the aging and somewhat rare (these days) Airbus A310-300, but RJ have just acquired a couple of near-new Airbus A330-200 (from the now defunct Air Comet of Spain). These aircraft have been fitted with new seats in both business and economy class, featuring Audio Video on Demand. They are being used on flights to Bangkok, Hong Kong, Kuala Lumpur and I believe London as well. I arrived at Bangkok by Taxi about 2 hours before the scheduled departure time, sadly I don't have sufficient status with oneworld alliance to get any lounge access on an economy ticket. This didn't worry me so much as it had been a while since I used any of the airport facilities as I normally just sit in the Thai, Singapore or Qantas lounges before I fly. Check-in was very quiet, no queue at all. The check-in staff were in Thai Airways uniforms, obviously contracted by Royal Jordanian. After check-in was complete it was off to passport control and through security. Both were quick with only small queues. I decided to go to Coffee World near the E concourse for a pick me up latte. With the departure time less than half an hour away the aircraft had still not arrived from Amman. It seemed there would be a delay today. Never the less I decided to go to the gate holding area and wait there and browse facebook on my mobile. Gate E3 holding area. Not very busy! I arrived in the holding area to find just 50 or so passengers waiting and the jetway still with no aircraft attached to it. I settled down in one of the padded seats, browsing my mobile. I looked up a moment later to see JY-AIE, a 2 year old A330-200 in the lovely Royal Jordanian colours pulling in. By the looks of things the flight in from Amman was fairly full, with a large number of passengers streaming out and heading towards immigration, mostly they appeared to be tourists with a large number of families. I'm not too sure how many continued on to Hong Kong, but I don't think it was very many. The crew for this evening had just arrived in the gate area. The inbound crew from Amman would be staying in Bangkok today, and our new crew would operate the return flight from Bangkok to Hong Kong and return. It did not take long after the crew had boarded before boarding commenced. With only 60 or 70 passengers to board, it did not take long at all. At this point we were running about half an hour late. Boarding for economy was via the 2nd door. I did not know what to expect from the RJ cabin crew but I was initially pretty shocked by the demeanour of the lady checking boarding passes at the aircraft entrance. She did not smile, did not say welcome or hello, simply looked at your boarding pass and gestured either to cross to the other side or turn immediately right. Not a word was said!! Such a difference to what I am used to. One thing I did like though was the nice wooden, or immitation wooden floor boards at the entrance area of the aircraft, it looked fancy! The seats were lightly coloured with nice red pillows and blankets on each one. The cabin felt modern and airy. Very nice. I was in Row 9, which was in the forward part of the first economy cabin. The seatpocket contained the safety card, a fairly hefty duty free catalogue and the inflight magazine 'royalwings'. The inflight entertainment guide was contained within the magazine and not as a separate document. Some pleasant boarding music was playing and the seatback screens were showing various scenes (presumably from the airline destinations) as well as promotional video of the airlines aircraft flying. The welcome announcements were done first in Arabic, then English and finally in Thai. We had one Thai flight attendant working on today's service that I could see. No menu's were handed out, however headsets were distributed and the inflight entertainment was available from gate to gate which I love! Flying time was announced by the flight attendant as 2 hours 30 minutes, the flight attendant also announced the cruising altitude (41,000 ft) which is quite unusual. Cruising altitude would be something I thought I would hear from one of the pilots, but neither of them made any announcement at all. Just before pushback the safety video was played, it is played in it's entirety in Arabic, and then again in it's entirety in English, which takes quite some time! I was already settled down and watching a movie as we pushed back, with the entertainment available gate to gate. Unfortunately there was not much choice available, with only 5 or 6 western movies and just a few television programs. Enough to get me through this short flight, but one would quickly run out of options if you were a regular flyer on RJ. During the pushback and engine start sequence I noticed QF2 from London beside us, it was nice to see this Qantas bird, always makes me feel home sick! She can be seen in the photo above preparing to continue on to Sydney. A car with 'Kuwait Airways Engineering' followed us during the pushback and you can also see that in the photo above. We taxi'ed over to Runway 19L and made a rolling start, we were quite light so after a short takeoff roll we were up and away, making a couple of left hand turns before tracking north east towards Hong Kong. Soon after takeoff the seatbelt sign was switched off and I took a visit to the lavatory and took the customary lavatory shot below. There was no amenities provided at all other than soap and tissues. After about 30 minutes the crew came through the aisles from front to back with Dinner. There was 2 trolleys, the first with the food and the one following immediately behind it with drinks. Three choices were offered, Chicken, Beef or Fish. I was impressed at having 3 choices and the flight attendant even smiled for the first time that I had seen on this flight as I selected the chicken, she said 'Enjoy your meal'. The cart behind had what appeared to be a full bar including water, beer, soft drinks, wine and basic spirits. Only one round of drinks was offered, more was probably available on request. The meal was really quite nice! I enjoyed my chicken curry and the salad was good and came with a packet of salad dressing. The dessert was a chocolate and banana cake and that was good too. After most people had finished their meals the crew came around with a tea and coffee service. There was no milk or creamer provided at all that I saw, so I hope you like your tea and coffee black! I took a coffee, and it was quite nice. After the trays were cleared we still had over an hour to go to Hong Kong. We were cruising along at 41,000 ft and there was a few periods of light turbulence in very high cloud. The seatbelt sign came on and off a few times during the journey. With total darkness outside the aircraft slowly tilted downwards and we began our descent into Hong Kong. Although we had been experiencing a bit of turbulence during the flight, the descent itself was quite smooth. We made a smooth touchdown and taxi'ed to the gate. My first flight on Royal Jordanian complete. I think it was a pretty good experience overall. The hard product (seats, inflight entertainment system etc) is quite good. The food quality was good, and choice was great. Things that could be improved on is offering more drinks, having milk available for coffee and tea, and the flight attendants could learn to smile a bit more. They were mostly very serious looking and did not give off a good vibe overall. Next up, the return to Bangkok. I would be using the airport train to get to HKIA tonight, I took the Airport Express bus from Tsim Sha Tsui to Kowloon MTR station. We were dropped off at the check-in desks and I quickly found Royal Jordanian check-in was available at counter 24, the same counter was being used for Phillipine Airlines. 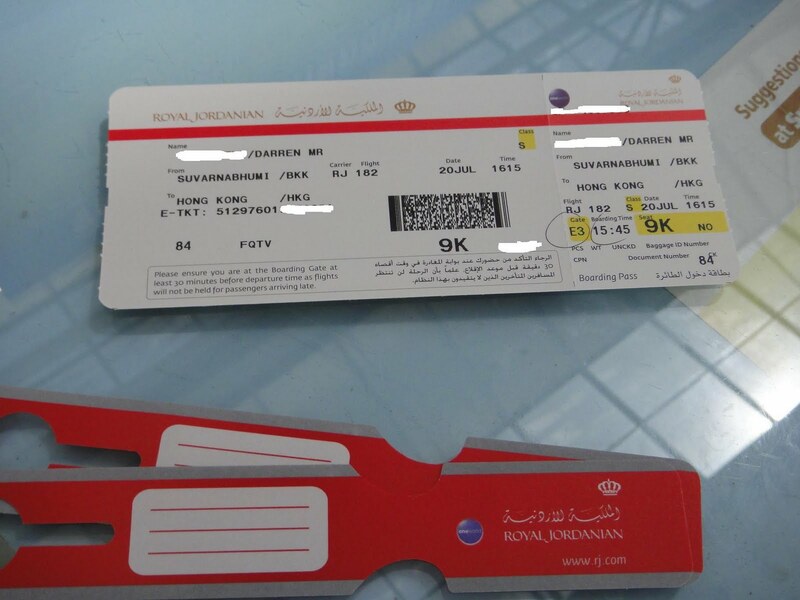 Checkin was quick and painless and I was handed my Royal Jordanian boarding pass for 31H, an aisle seat in the rear cabin. Unfortunately I just missed the train, the doors were closing as I reached the platform. Never mind, the next train would be just 8 minutes away. Royal Jordanian is one of the carriers that use the Terminal 2 check-in zone so I walked through thre after getting on the train. My bag had alread been checked in at the train station so there was no need to stop at checkin here. Instead I proceeded straight through passport control. It was a pretty quiet evening and I was running slightly late so I simply walked straight to the gate area after taking the terminal train towards Gate 17 where we would be departing from tonight. As I arrived the boarding process had already commenced. As I entered the aircraft I was greeted with absolute chaos. Tonight we had about 150 Chinese package tourists on their way to Thailand. And it seems that almost none of them have flown before. There was people posing for pics all over the place, and the aisle was completely clogged with Chinese women who just did not seem to want to sit down. It took me quite a bit of effort and the assistance of one of the cabin crew to get the aisle clear for me to get to my seat. I have to admit to kind of losing my patience and slightly raising my voice with a 'Please sit down! ', the lovely flight attendant nodded at me in agreeance. I got some apologies and finally I was able to continue down the aisle to the rear economy cabin. It was very loud with very excited chatter and cameras flashing everywhere. I knew this flight was going to be painful at this point!! It took quite some time for our package tourist passengers to settle down, of course none of them paid any attention to the safety video. There was a lot of confused elderly Chinese trying to work out the inflight entertainment system and wonder why they couldnt do anything while the safety video played. The woman across the aisle from me saw me put my blanket on the floor and kept gesturing at me to pick it up?? I had no idea why! I said, 'No No, its ok!' but she just gave me a look as if I was some kind of freak and kept pointing at the blanket. This same woman I saw during the meal service put the knife, fork, spoon, and some of the serving bowls into her hand baggage. Thief! Well, we ended up pushing back a little bit early and the passenger load looked pretty good, I would say at least 90%. The vast majority of whom were only travelling to Bangkok and not continuing on to Amman. We taxi'ed to the runway and departed making a right hand turn over the lights of Disneyland. There were many 'oohs' and 'aahs' as the aircraft entered some light turbulence, or when people noticed lights out the window. We climbed to 36,000 ft and levelled off, the meal service then commenced. I had been anticipating a full hot meal but sadly tonight's flight was a snack only service. In fact the aircraft had been catered in Bangkok for the return trip from Hong Kong also. The meal consisted of salad, fruit and sandwich. There was no choices. I thought at least a bar service would be on offer, but I was wrong. You had the 110ML packet of orange juice plus tea and coffee only (again, no milk). Then later on in the flight they brought around some glasses of water for those who wanted it. I asked the crew member serving coffee whether a bar service was available, he said no it's just a snack flight. I asked for a Coke anyway and he said he will go look for one. He came back a few minutes later with a Pepsi... much to the disgust of the passenger behind me. That other passenger asked for a Pepsi too, but got refused, the crew said they can't serve everyone. To be honest I found this pretty pathetic for a full service carrier. If I was continuing on to Amman on this flight I would be looking forward to having a few drinks on the first leg to Bangkok... it seems this is not the case with RJ on this flight. I hope it's better up in Business class! The meal service was over pretty quickly and the crew cleared the trays. The package tour groups were still very rowdy and chatty. I can understand they were excited to go on this holiday but I found it really annoying! I regretted not bringing my noise cancelling headphones on this trip, I had to make do with the airline supplied headset which did not block any outside noise at all. The remainder of the flight was pretty routine and we landed in Bangkok a little early, parking next to a rare Boeing 747SP of Iran Air. Although the flight was adequate I wasn't very impressed by this second flight on RJ, I expected better in terms of drink offerings, and food too. The crew were just average and the other passengers (not the fault of RJ I know) were quite an annoyance.